book reviews, discussions, and more! 2019 Reading Challenges I’ll Be Participating In! First off – Merry Christmas! I’m not too much of a sentimental person, and usually hate the holidays, but I have to say: I had a pretty decent time this year. It was amazing getting to spend time with my family, relax, and have fun. Anyways, it was one of my goals last year to participate in some reading challenges; I’d always see people doing them and they looked like so much fun! Unfortunately, that never happened, but this year, I vow it shall. This year should be super interesting, not only because I’m blogging and wanting to do these challenges, I’ll be graduating soon, and be moving towards the end of summer/fall. I’m a little scared (not going to lie) but SUPER excited! After hours of going down a rabbit hole of challenges, I finally came up with a few (okay, a lot, fine) that I would like to participate in! So I went overboard, yes? But I’m hoping that a lot of the challenges will overlap…. maybe? Haha, here we go! P.S – I’ll be linking to individual pages or something as an “update” for each challenge so that this post doesn’t have to be any longer than it already is. I’ll probably add it as a drop down on my main menu or something, we’ll have to see. Whatever I decide, you’ll know eventually. First challenge is the Audiobook Challenge hosted by Hot Listens and Caffeinated Reviewer. I’ve only gotten into Audiobooks this year and I’d love to explore them more. I’ll be aiming for Weekend Warrior (5-10 books). Updates here. 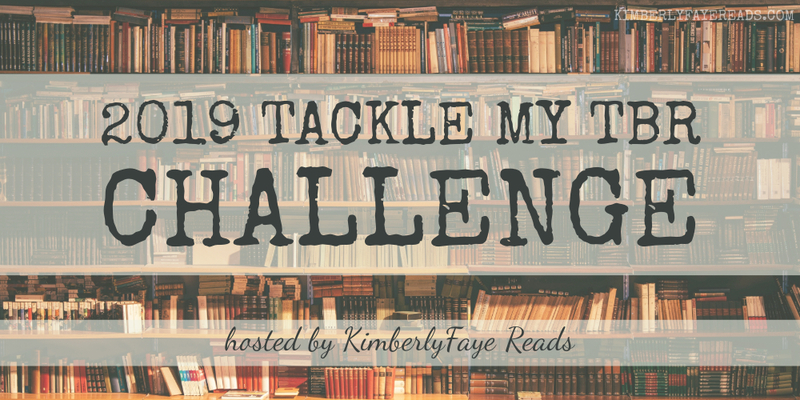 Next up we have Tackle My TBR Challenge hosted by kimberleyfaye reads. I’ve wanted to zero down my TBR for awhile now (I’m getting better guys, I swear) and I think this is the perfect challenge. I’ll be aiming for Hail Mary (49-60 books). I have about 60 books on my physical TBR right now and I’m looking forward to changing that! Updates here. The 2019 Reading Challenge by mommy mannegren sounded pretty fun and interesting. There is a prompt for every week and the goal is to read 52 books in a year. I’m more doing it for the prompts, since I usually read well over 52 books in a given year, but it should be exciting (I liked the concept of a weekly prompt, rather than say, the Popsugar challenge where it’s a bit of a free for all. Just me?) I’ll be aiming to do at least half of it! Updates here. This one has to be a personal favorite – besides historical fiction, fantasy is one of my favorite genres (that I totally didn’t read enough of this year!) Hosted by the lovely A Dance With Books, Dancing with Fantasy and Sci-Fi is right up my alley! I’m going to aim to complete all of the Fantasy challenges, but it’ll be a stretch completing any sci-fi – I’m a self proclaimed sci fi hater. We’ll see? She’s included some awesome recs which I’ll definitely need! Updates here. Finishing the Series Challenge hosted by Celebrity Readers is also another favorite. I need to go rummage through my Read shelf on Goodreads and find some ideas for this challenge (Raven Cycle, I’m looking at you!). I’ll be aiming to finish 5 series(s) – I’m trying not to be too ambitious considering I know I’ve started series(s) with six or seven books left. Updates here. Another super exciting one for me, since Historical Fiction is my favorite genre, I’ll be participating in the Historical Fiction Reading Challenge hosted by Passages to the Past. Like I said, I read primarily HF, so I’ll be aiming for at least Medieval (15 books). Updates here. Talk about the complete opposite of the last, of course I have to shake things up with some Contemporary Romance. Hosted by Andi’s ABCs, the Contemporary Romance Challenge sounds super awesome. Not going to lie, I’ll have to figure out how this one works… I’m not super reading-challenge-book-technology savvy. I’ll be aiming for Home Run (16-20 books) Updates here. Just when you thought I couldn’t add more… yep, I’d love to do this one too! The Retellings Reading Challenge hosted by Corner Folds sounds like an awesome time. I’ll be aiming for Warrior Princess (6-10 books.) Updates here. Back to the Classics hosted by Books and Chocolate will be super fun. I read a lot of classics back when I was 12-14, but haven’t picked up a lot in the past couple years. I’ll be aiming for at least six books, and will link to an individual post/page in a hot second here when I’ve decided the categories! Updates here. The Library Love Challenge hosted by Angel’s Guilty Pleasures is what inspired me to look for more challenges. I’ll be aiming for Library Addict (48 books) Updates here. Whew – that was more than I thought! I’m super excited for everything in the up coming year, and thrilled to be able to participate in these challenges. I’d love to know if any of you will be participating – leave me a comment! Sure is… *sweats nervously* I have an ongoing classics list as well, though I don’t know if I’ll finish it any time soon… I basically have all of Dickens’ works and that alone could take a year! Hooray! I’m happy you’re participating in the Tackle My TBR Challenge! Good luck on your goals! I still have to decide which challenges I want to participate in but definitely a lot in your posts sounds interesting! I also chuckled about the self proclaimed sci-fi hater bit, I can kind of relate. Yay! So glad Finishing the Series made your list!! I’m participating in a few similar challenges to you! I’m also newer to audiobooks, so I signed up for that one, as well as retellings!! And trust me, you will overlap…I’ve done multiple challenges, and I find you overlap often! 🙂 Good luck with all your goals! reader. writer. dreamer. experimental blogger. reading my way through life. help support my blog and get updates every time I post via email. We Need to Talk #2 – Is YA Dead?